COOL DINING IN LON’S UNDERGROUND WINE CELLAR: Through September 16th, the hotel's signature restaurant will be opening its private subterranean wine cellar to offer a special tasting menu ($65++/person) along with a wine pairing option (additional $35/person). Cool (in every sense of the word), the cellar – kept at 57 degrees – is normally available only for private events, but will now be open for parties of two or more, Thursday through Sunday nights, but it can only be reserved within 7 days and by calling LON’s at 602.955.7878. $49 THREE-COURSE SUMMER PRIX-FIXE MENU: Executive Chef Jeremy Pacheco offers a three-course prix-fixe menu for $49 at LON's offered through September 16th. HACIENDA BRUNCH FOR TWO: For $32 per person, the Hacienda Brunch for Two features a shared starter, choice of two entrees or salads and two featured boozy beverages. New to the brunch cocktail menu are the colorful and refreshing Margs, ‘Mosas & Mules, the White Sangria, and red, yellow or green Marys with one of three infused AZ Mission vodkas and fresh tomato juice. SIP AND SAVE ON SUNDAYS: Enjoy summertime sipping savings on Sundays with 50% off on a generous selection of wines by the bottle, from 6:00 -9:00 p.m., exclusively in LON’s dining room. LON’S LAST DROP EXTENDED HAPPY HOUR: Through Labor Day, LON’s Last Drop celebrates summer with happy hour pricing from 4 p.m. to close, with reduced pricing on Arizona craft canned beer, wines on tap and draft cocktails, plus half-priced bar snacks. Carafe & Cellar is an incredible value for just $28, which boasts a board of artisan meats and cheeses ‘from the cellar’ accompanied by house-made pickles, grilled Noble bread and a carafe of wine on tap. LON’s LAST DROP BBQ BOARD FOR TWO: Savor the flavors of summer with a bountiful BBQ Board for two, offered exclusively in LON’s Last Drop through September 3rd. The board will feature a hearty rotation of house smoked favorites; such as pulled pork sliders, house smoked baby back ribs and sausages, plus side salads and more, for just $36. For $18, add a carafe of draft wine or a growler of draft beer for a great dining deal. Bloody Wednesdays: Enjoy 50 percent off all Bloody Marys, all day—whether it's The Original, The Virgin, or the BYOBM (Build Your Own Bloody Mary) Bar—which includes more than 40 craft toppings for you to create the ultimate Bloody Mary. This special happens every Wednesday from now through October 1. “Bottomless” Mimosas: The craft "bottomless" mimosas will cure your thirst all summer long. Get single mimosa refills for only 1 cent when you buy your first for $9. Any flavor, any location, all day Monday-Friday (excluding holidays). Guava, ruby red grapefruit, blueberry and mango are just some of the options available. Mom Mondays: Every Monday through October 1 Hash Kitchen is offering moms and dads a deal on kids meals. Children under 12 eat free when an adult entrée is purchased (excluding holidays). Hash Kitchen has two locations in Scottsdale. One at Gainey Village at 8777 N. Scottsdale Road and another at 14838 N. Frank Lloyd Wright BLVD. Another location in Arcadia and in Chandler are slated to open later this year. For more information on Hash Kitchen and these specials, visit them on Facebook @hashkitchenAZ or their website at Hashkitchen.com. Different Pointe of View, the award-winning mountaintop restaurant located 1,800 feet above the city at Pointe Hilton Tapatio Cliffs Resort, is offering locals an incredible dining deal this summer with its Summer Prix-Fixe Menu. The menu features a full three-course dinner for just $44 available June through September at Arizona’s longest running AAA Four Diamond restaurant. With floor-to-ceiling windows delivering dramatic views from every table in the dining room, guests can enjoy summer dining at a fantastic value from the comfort of the cool indoors with a back drop of the twinkling city lights and dramatic desert mountain landscape. The Summer Prix-Fixe Menu includes choice of an appetizer course, main course and dessert. For additional dining information and reservations call 602-866-6350 ext. 7200. Dining reservations can be made online at www.libertystationtavern.com or by calling 480-595-9930. Restaurant hours unless otherwise noted above: Open daily 11:00 a.m.-9:00 p.m.; Happiest Hour 3:00 p.m.-6:00 p.m. daily. Address: 34522 N. Scottsdale Rd., Scottsdale. TEXAZ Grill chef & owner Steve Freidkin has developed a special menu of summertime lunch favorites available for only $9.50, including Grilled Chicken Caesar Salad; Fish Tacos featuring grilled cod, shredded cabbage and chipotle tartar sauce, or a Turkey Wrap with avocado, bacon, lettuce, red onion, and tomato. Beat the summer heat with three new refreshing summer cocktails that incorporate Texas liquors, including Tito's Handmade Vodka in Karen's Citrus Cooler and Railean Rum in the TEXAZ Twister. Back by popular demand, Sauce’s Summer Sampler is available through August 31. This means that all summer, guests can grab a date or bring a friend and savor one of Sauce’s salads, a 12-inch pizza, and two glasses of wine or beer for just $22! Guests can choose from a variety of salads, under $9, including the Turkey & Feta salad or the seasonal Watermelon & Arugula salad, made with roasted pumpkin seeds, jicama, red onions, and feta cheese tossed in a white balsamic vinaigrette. Indulge in any gourmet pizza, under $11, such as the Portobello and Artichoke or the Chicken Pesto, a white pizza made with pesto chicken, fresh mozzarella and marinated tomatoes. Top off the experience by selecting two glasses of any wine or beer $7 and under. For more information, visit www.saucepizzaandwine.com. Bottle and App: Starting at 7pm in the Bar and Lounge, purchase any bottle (750ml) of Wine or Sake and enjoy 2 complimentary Hot or Cold dishes from the Bar Menu. Roka Bar Omakase: $45/pp | Only Available in Bar & Lounge. Small bite tasting menu designed to take you on a culinary journey of our cuisine. Includes signature and specialty dishes from the Robata Grill, Sushi, and Tempura kitchens. Annual Taste of Quiessence: This special menu features hyper-seasonal Arizona ingredients displayed throughout a three-course dinner. For each tasting date, Chef Dustin Christofolo will compose a variety of dishes for the evening. The “Taste of Quiessence” Chef’s Tasting Menu will be available on Tuesdays through Thursdays from June 12 through June 28. The special Chef’s Tasting price will be available to the first 12 diners who reserve on the special event dates. The three course “Taste of Quiessence” is $45++ per person (price does not include tax and gratuity) and a wine pairing option is available at $20++ per person. In order to secure a reservation, guests must call 602-276-0601 and mention “Taste of Quiessence.” Twelve reservations are available each evening on the following dates: June 12, June 13, June14, June 19, June 20, June 21, June 26, June 27, June 28. Thursday Wine Flights in August: Take flight each Thursday in August when guests will enjoy a curated flight of wines and trio of small tapas. The Quiessence in-house Level II Certified Sommelier, Alison Sponberg, will hand pick each wine tasting to best pair with Chef Dustin Christofolo’s special wine flight menu for the evening. Learn about new and old world wines themed to the week’s special menu. Cost is $40 per person++. Please call 602-276-0601 and mention “Thursday Wine Flights” to receive this special menu and pricing. Quiessence at The Farm: 6106 S. 32nd Street Phoenix, AZ 85042. Thirsty Lion Gastropub & Grill is rolling out a brand new Summer Fresh menu starting Friday, June 15. The menu features eight light, seasonal and flavorful dishes and dessert, three new cocktails, plus seasonal beers and wine. Also, when the temperature is above 105 margaritas and Moscow mules are half priced! There are three Valley locations: 2000 E. Rio Salado Parkway, Suite 1041 in Tempe, 7014 E. Camelback Road, Suite 1423 in Scottsdale and 2212 E. Williams Field Road in Gilbert. www.thirstyliongastropub.com. Join Sonata's for a special Summer 3-Course Menu for $29.95; available daily. Thai Chili 2 Go gets things sizzling this summer with specials and promos that allow guests to keep their wallets fat and their bellies full, starting with a social media contest that results in free food! Each Friday Thai Chili 2 Go followers can comment via Facebook about why their office deserves a free lunch for up to 15 people. A winner will be announced weekly the end of August. For a cool night of “chill” and “Chili” (as in, Thai Chili 2 Go), all summer long diners will receive a free Thai Dumpling appetizer order and a code for a free Redbox movie rental with the purchase of any two entrees. Guests must mention “Dinner and a Movie” upon ordering to redeem this offer. Available for dine-in or take out only (not delivery service orders). Summers and parties go hand in hand, but who wants to get all hot and bothered in the kitchen while prepping food for the festivities? Thai Chili 2 Go can handle the heat and with their “Thai-rific” summer dinner parties catering pricing, guests can present delicious food while still enjoying the party! Trays that serve up to five people begin at $50, and trays that serve up to 10 people begin at $100, so party hosts can look like a star without breaking the bank! Date: Offers available through August. Prime Rib Sunday & Monday. In addition to the summer menu, Bourbon & Bones offers a special prime rib dinner every Sunday and Monday of slow roasted prime rib, seasonal vegetables, popover, twice baked potato and au jus. Price varies by cut: Old Town Cut (8oz) $36; 3rd Ave. Cut (10-12oz) $39 and Buddha Cut (16oz) $42. Happy Hour. The year-round Happy Hour Monday – Friday, 4-6pm, features: Crispy Calamari, Artisanal Cheese Board, Bourbon & Bones Burger, Chop House Meatballs, Prime Rib Sliders and The Devils Cut, Hot Rock Wagyu Beef. Featured beverages include Sub Zero Whiskey N Coke, Chophouse Martini, draft Wine and Domestic Bottles. $15 off an All-American Feast or $10 off a BBQ Feast for 2. www.famousdavesbbq.com Offer expires 7/8/2018. Valid at the Valley locations only. Cannot be used with any other offer. Chandler at 3250 West Frye Road; Peoria at 16148 North 83rd Avenue, SanTan Village in Gilbert at 2206 E Williams Field Rd and Mesa Riverview in Mesa at 1011 Dobson Road. Through the end of August, Sierra Bonita Grill will be offering extended happy hour, daily from 3 p.m. to close in the bar and sunroom areas. Stop in this summer and enjoy specials on cocktails, beer, wine and happy hour-only appetizers and entrees. Food and drink specials include $7 signature cocktails and glasses of wine, $7 appetizers and entrees, $5 well drinks and draft beer, and $4 domestic bottles. There are a variety of refreshing summer cocktails offered, such as the Fresh Squeezed Margarita shaken with tequila, orange liqueur, fresh lime juice and agave nectar; the Miguel's Mule featuring vodka, fresh squeezed lime, bitters and ginger beer, served on the rocks in a copper mug; or the Daiquiri Anos shaken with Bacardi Grand Reserva Anos, fresh lime juice, and simple syrup. Munch on Borracho Nachos, Queso Fundido Con Chorizo, Frito Pie, a Sonoran Dog, or one of the many other dishes offered on the happy hour menu. Sierra Bonita Grill is located at 6933 N. 7th St. Phoenix, Ariz., 85014. For more information, call 602-264-0700 or visit www.sierrabonitagrill.com. Lincoln, a JW Steakhouse located at the JW Marriott Camelback Inn Resort & Spa, is featuring its Summer Sizzler Three-Course Dinner special between now and September 9, 2018. For only $39 (plus tax and tip), guests will savor a choice between three entrees including the Cedar River Farms 7 oz center cut filet, an organic rosemary lemon-bricked chicken or the Skuna Bay maple mustard salmon. Known for its delectable side dishes, diners will have to narrow down the options between the goat cheese au gratin potatoes, green chile mac n' cheese, Brussel sprouts with bacon and golden raisins, grilled asparagus with charred lemon, miso chile creamed corn or the drunken wild mushrooms. The sweet finale is a choice between the German chocolate cake, or the over-the-top, out-of-this-world JW signature cheese cake. Lincoln's menu boasts hand-cut Prime butcher's steaks perfectly seared at 1200 degrees in the Valley's only Josper Charcoal Oven from Spain, which is fired by extremely high-heat hardwood charcoal briquettes from Argentina. Lincoln also serves a wide variety of fresh seafood, vegan options, house-made sauces and innovative sides and starters including its signature lobster escargot. Lincoln's summer hours are Tuesday through Thursday, 4 p.m. to 9 p.m. and Friday and Saturday, 4 p.m. to 10 p.m. The restaurant is closed on Sundays and Mondays. Regular hours of service will resume on September 9, 2018. For reservations or further information on Lincoln's Summer Sizzler Three-Course Dinner call 480-905-7979. Valet parking is complimentary. Cool off this summer with 2 for 1 tropical cocktails as Hula's Modern Tiki celebrates the return of Monsoon Mondays with tasty deals on Dark & Stormy and the Hula's Hurricane cocktails. 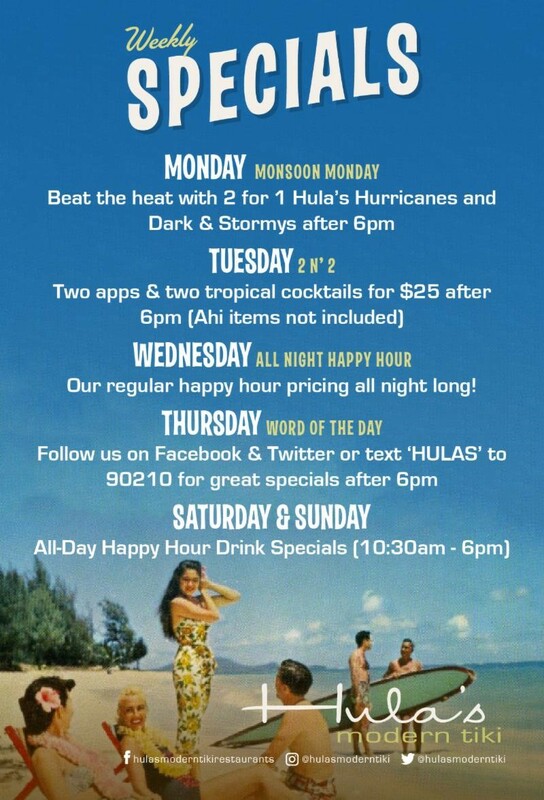 Hula's Monsoon Mondays are offered weekly from 6pm to close at Hula's Modern Tiki in Phoenix and Scottsdale. Plus, Hula's offers additional daily specials year-round. 4700 N. Central Ave., # 122 7213 E. 1st Ave.